Naturally caffeine free. 4 calories per cup. Sugar free.All Natural Ingredients* *All our herbs are gently steamed, the process is gentle to protect their delicate taste Look up at the sky and see a kite dancing over houses and the trees in the cooling, gentle breeze. Cup in hand, feet firmly on the ground, you too can feel as light as air with this refreshing infusion. What does it taste like? 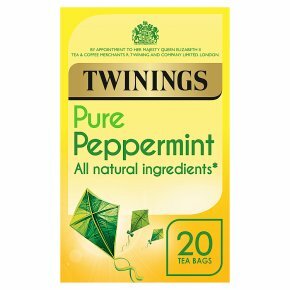 Cool and invigorating, we've expertly created this peppermint infusion to help you feel refreshed and ready for the day with each sip. A classic, vibrant blend perfect for any time of day.